The Spy Who Shrunk Me comes out December 18th 2018 for PC & Q1 2019 for VR! The Spy Who Shrunk Me launches on PC on December 18th 2018! We are launching on Steam Early Access and we’ll stay in Early Access until our VR edition is ready for prime time. The game in Early access is playable from start to finish with many exciting missions where you get to save the world before the Cold War turns red hot! We’ll use Early Access to add even more gadgets to the game while cooking up our VR edition. Buying the game in Early Access means you’ll be able to get your voice heard and help us refine our stealth experience. So the game’s PC version is more-or-less finished, we just want to get out of Early Access with both PC & VR. The Spy Who Shrunk Me is a fully voice acted narrative experience where you get to drive a miniature car, drop people down paper shredders and defuse a nuclear missile from within! The game stars the talented Louise Saint-Claire as Miss Audrey Smoothspy. Fans of the old classic No One Lives Forever games can rejoice – this game is a huge love letter to the legendary spy game series! We’re bringing non-lethality to the classic formula, as we think a smooth spy never should resort to getting caught. If you do get an alarm, you can always hide using your trusty Shrink Ray. The game is all about pure stealth. In fact, you can play the entire game through without harming a single soul and never getting detected. A full ghost/pacifist run is possible and even encouraged! Fancy yourself a bit of a lunatic? You can always just toss every enemy you see into the nearest paper shredder or skip objectives at your leisure. We’re not judging. Your employers might. Missions range from hacking servers, sabotaging equipment, extracting targets and taking out key personnel to saving the world itself from the Soviet menace! We’ve got plenty of exciting levels with fun gameplay with narrative twists and turns. As you move further into the CON-NEX complex, you’ll figure out secrets of the Soviet Union and ruin the plans of General Boris B. Bolscotchkovich and Ernst E. Eierkopf! 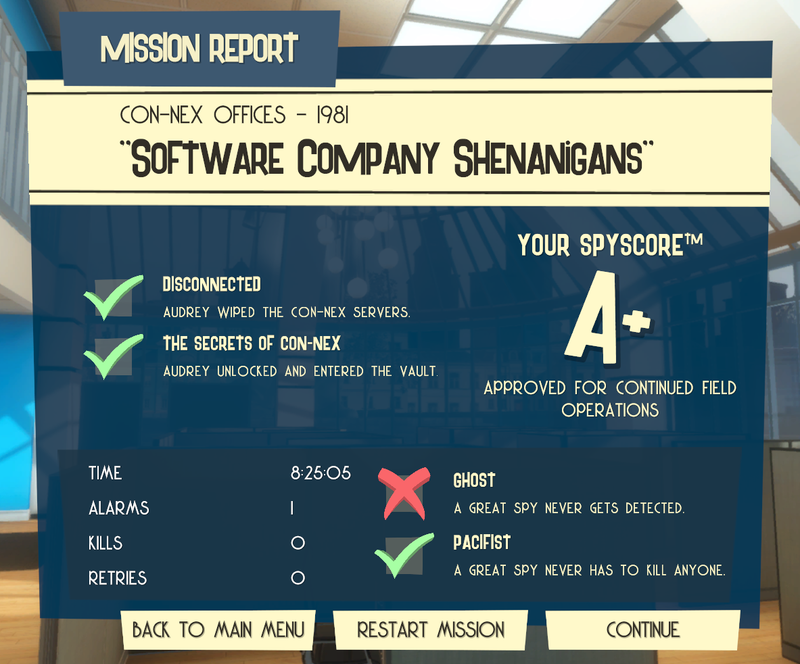 After each mission you’ll get a handy Mission Report which will give you a SpyScore™ ranking your spy exploits. You can complete objectives in the manner you see fit – even skipping objectives altogether. There are multiple outcomes to specific missions – you’ll know it when you see it! You’ll get the titular Shrink Ray during your first mission, onboard the Moscow Express! Use your trusty Shrink Ray to squeeze under small spaces and avoid enemy detection. Use your tiny form to easily avoid enemy gunfire and mix and match your Shrink Ray shenanigans with the Teleporter to find a new perspective! We’re not giving you rifles and pistols. Combat in The Spy Who Shrunk Me is all about utilizing your Shrink Ray. Shrink enemies and drop them down paper shredders or throw them at a wall to lethally eliminate them. Or drop them down a lidded trash can to take them out the pacifist way. Make enemies slip and slide! Enemies who slip on a banana peel are down for the count for a good while, allowing you to slip past undetected. Slap one of these bad boys on a wall or floor and watch the enemies fly! Airbag mines give you a chance to get past enemies with ease. Reach new heights with the teleporter. Kind of like Blink from your other favorite stealth title, use it to peer above enemies on top of lamps and maneuver yourself on top of tables while shrunk! During Early Access, we aim to add even more wacky gadgets to the game! These include Spytacles (which let you see enemies through walls!) and the Stopwatch (which freezes time for a while letting you get past enemies while time stands still!) We’ll also take ideas from the community – if you’ve got a great gadget idea, let us know. We need a bit more time for this, but the ETA is Q1 2019. We have a new technology stack in our game that will support further games down the line with both PC & VR supported, so it’s just refining the experience to make sure every bit (including the driving section) works in both formats. We apologize for the delay on this. We will keep you updated on our various social media channels. We mostly keep our Twitter updated, give it a follow! We’re also going to be dropping even more screenshots and gameplay footage as we go closer to the release! What do you want to see? Let’s us know and we’ll do our best to spoil you. Posted in News | Comments Off on The Spy Who Shrunk Me comes out December 18th 2018 for PC & Q1 2019 for VR!